Four Your Paws Only is an award winning, locally owned Pet Specialty Store that offers so much more than ordinary pet stores. 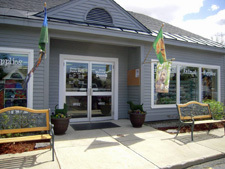 Nestled in the heart of the Mount Washington Valley region of picturesque New Hampshire, their unique shop is located in the quaint town of North Conway and has been a destination for pets and pet lovers since 1994. You could say that Four Your Paws Only is a pet supply store… with a twist! 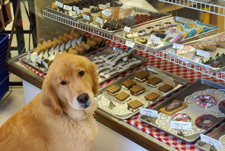 Not only do that they carry a full line of Dog, Cat, Bird and Small Animal Foods & Supplies, they also have an on-site Pet Bakery where they make their own treats, feature a one of a kind Puppy Playroom designed specifically for Doggie Playgroups and… they carry a great variety of unique Gifts for Pets and Pet Lovers too. Owners, Brian and Kathy Ahearn and their team strongly believe in offering a more personal, one on one shopping experience for pets and their owners, providing outstanding customer service and giving back to their community. Four Your Paws Only or “FYPO” as the locals call them, carries a great selection of all natural pet foods, high quality pet supplies, locally made pet products and great selection of pet themed gifts. They are known far and wide for their famous on-site Pet Bakery where you can actually watch as they make their own line of human grade dog treats that look and smell so good, you’ll want to eat one yourself. FYPO is also well known as the “local canine hangout” and offers complimentary Doggie Playgroups every Saturday and Sunday to help owners socialize their dogs and puppies. They offer nail trimming, training classes and host a variety of pet friendly events throughout the year. Their friendly, knowledgeable staff is always happy to help you with any problems and/or concerns you may have about your pets. Four Your Paws Only is very active with regards to animal welfare and is an avid supporter of local animal rescues and humane societies. They volunteer their time, donate food & supplies, host many in-store fundraisers, financially sponsor shelter events, and promote adoptions through in store meet & greets and via social media. In addition to the work they do with homeless animals in need, Brian, Kathy and several FYPO team members are also very involved with The White Mountain Disaster Animal Response Team and are always willing to help when there is an animal in need. Four Your Paws Only is also an active member of The White Mountain Independents, a group of local, small business who are committed to supporting their local economy, giving back to their community and encouraging folks to shop locally.